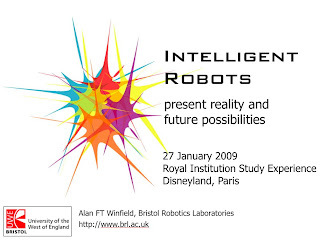 Just gave a Walking with Robots talk for about 450 school children, at Disneyland, Paris. The Gaumont cinema to be precise, on the Disneyland complex. This was the first time I've given a talk in a cinema - with my slides projected onto the giant sized cinema screen behind me! My audience, who I discovered had been bussed from various schools across the UK, were attending a Royal Institution Study Experience - a kind of science winter camp. Even allowing for the cold and grey January weather - what a great way to spend a few days of intensive hands-on science. Returning on the Eurostar from a really interesting workshop in Brussels, on Robots for Risky Interventions and Environmental Surveillance (RISE 09). The focus of the workshop was a number of EU funded projects aimed at developing multi-robot systems in safety-critical applications. One project called GUARDIANS, led by Jacques Penders at Sheffield-Hallam, is aimed at providing firefighters with robot outriders, providing sensing and navigation that - in effect - give the firefighter extended super-senses. I learned that one of the most dangerous situations they have to deal with is large warehouse fires which quickly fill with smoke, making it very easy for firefighters to become lost and disoriented in the labyrinth of aisles between storage racks. But the flat smooth warehouse floor and grid like layout is of course ideal for mobile robots, making this a really good application for robots to prove themselves useful in a serious and worthwhile real-world task. 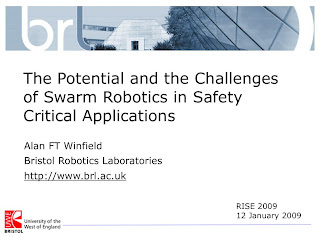 I gave a talk setting out the potential of using a swarm robotics approach to safety-critical applications. The swarm approach differs from the conventional multi-robot systems approach in its control paradigm. A multi-robot system will typically use a centralised command and control system to both direct the actions of individual robots and coordinate the whole group. In contrast a swarm uses a completely decentralised, distributed approach, in which each robot decides how to act autonomously - using local sensing and communication with neighbouring robots - so that the swarm self-organises to achieve the overall task or mission. Although the robots may look the same in both cases, the swarm approach is radically different from a systems control point of view. But the swarm approach offers the potential of much higher resilience to failure (of individual robots, for instance).